OXFORD, Miss. 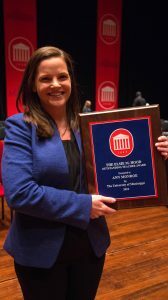 – The University of Mississippi is seeking nominations for the 2019 Elsie M. Hood Outstanding Teacher Award. Faculty, students and alumni are encouraged to nominate their favorite Ole Miss teacher; assistant, associate and full professors who have not received the award in the past are eligible. Nominations for the university’s pre-eminent teaching award are due by March 1. “It is the highest honor the University of Mississippi bestows to faculty for teaching excellence,” said John Rimoldi, professor of medicinal chemistry in the School of Pharmacy and the 2017 Elsie Hood Award recipient. “The (selection) committee evaluates student and alumni nominations of faculty that includes examples of exceptional and inspiring teaching. The winner receives a $5,000 prize, a personal engraved plaque and his or her name goes on a permanent display inside the J.D. Williams Library. The selection committee in charge of selecting the winner from nominees is composed of previous recipients, the director of Alumni Affairs and a student representative. This year, Rimoldi is the committee chairman. Ann Monroe, associate professor of teacher education and the 2018 Elsie Hood Award recipient, said it is fulfilling to know she inspired students enough for them to nominate her. “I was honored and appreciative to win the Hood award,” she said. “My colleagues in the School of Education and at this university are incredible teachers. Like them, I take my teaching responsibilities seriously and try always to model good teaching practices for my students, who will someday have classrooms of their own. The university’s Outstanding Teacher Award was commissioned in 1965 when the Faculty Senate submitted a proposal to Chancellor J.D. Williams to create a program of recognition for teaching excellence. The first award was given in spring 1966. In 1988, Mr. and Mrs. Warren A Hood Sr., of Jackson, made a gift to endow the award and it was named in Mrs. Hood’s honor. Nominations can be submitted online, by email to chancellor@olemiss.edu or by mail to Office of the Chancellor, Lyceum 123, University, MS 38677. Criteria for nomination include nominating letters that illustrate examples of exceptional teaching as well as letters that have been submitted for nominees in previous years.